A super quick (microwave!) version of Haloumi cheese, flavoured with herbs and chilli and ready to eat in under an hour. Update: On November 3rd the second photo in this post was chosen as the runner up in the Australian Eat Drink Blog 3 photography competition. Inspired by my recent adventures with 1 ingredient curd cheese making, I had decided to make haloumi. We love the salty flavour and squeaky texture of the cheese and often find ourselves munching on pan-fried slices of this Cypriot delicacy at snack-time. My first attempt over the weekend became a slight failure in that I used lemon juice (from 2 lemons) to help create the curd and so my cheese ended up more like a herbed curd cheese than haloumi. It was delicious, but a far cry from the salty, squeaky haloumi we’ve come to love. Not about to give up, I scoured the interwebs for homemade haloumi (aren’t we blessed these days). Buried amongst others, I found this super simple plain haloumi recipe and went on improving it by adding dried herbs and chilli to the mix. Simple and quick: you can make it in a microwave… (if you don’t have a microwave you can use this longer method). I got really excited because I hardly ever use the microwave for anything else than re-heating tea! And you don’t need any fancy equipment apart from a couple of things you probably already have or can easily find at your local chemist and supermarket: a sheet of gauze dressing and… junket tablets. An electronic human-use thermometer is optional. Now back to junket tablets – I didn’t even know they existed but apparently they make great cheese! They can generally be found in the most obscure spot of the powdered custard aisle of your supermarket. As mentioned, the thermometer is not entirely necessary because you’ll only be heating the milk to just below body temperature (32°-35°C // 89.5°F – 95°F) and you may just as well use your clean fingers to test the milk’s temp. Oh, and it also turns out that to make haloumi you need unhomogenised milk – the one where the cream sits at the top. Perhaps that’s why my first attempt resulted in curd cheese instead. Ok so maybe it sounds more complex than I first made you believe… but trust me, it takes less than an hour to make and once you have the gauze, the unhomogenised milk and junket, you are set. And once you pan-fry it, it tastes like nothing else in the world – perfect match for a watermelon salad. 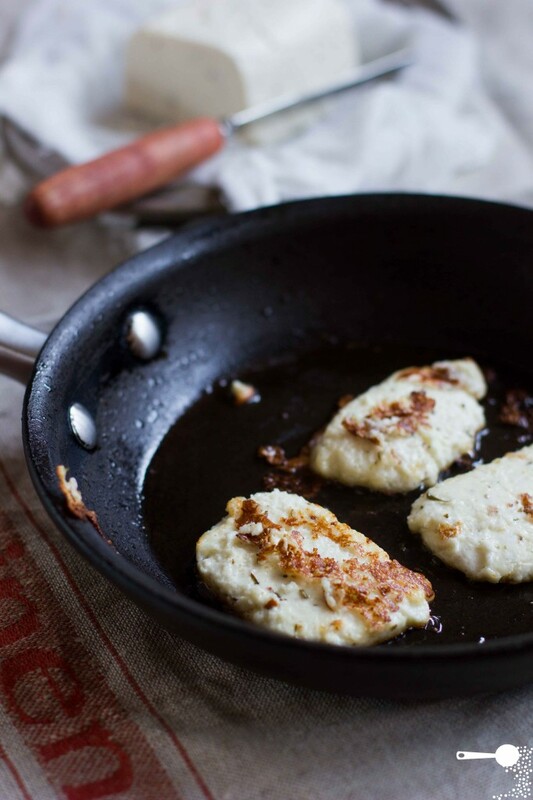 For a haloumi recipe using rennet and the slightly longer method, click here. To make the cheese you will need an electronic thermometer (for human use is ok, sterilised); a large sheet of gauze and a junket tablet. Junket tablets are available from most supermarkets and can be found in the powdered dessert aisle near custards and jellies. Adapted from a dairydoatssa.com website. Place both milks into a large saucepan. Dissolve junket tablet in 1 tablespoon water. Heat milk over slow heat until it reaches 32°-35°C // 89.5°F - 95°F. Remove from heat immediately and add dissolved junket. Once the milk has set, cut it up roughly using a wooden spoon and mix to separate the whey. Test the curds with your fingers - they should be elastic and slightly firm. If still very soft, stir and heat on high for 1 more minute. Strain the curds and whey, reserving 1/2 cup of whey for the brine. Press haloumi cheese into a rectangular container and place in the fridge to cool (or into the freezer for 15 minutes if you're more rushed). Junket is so good! Great idea. I still don’t know what it is in Polish, but I recall Mum or Grandma using similar tablets in the kitchen. Might have to ask them… Either way, it works wonders in this recipe. Thanks Magda, great link and yes, I spoke to Mum last night and she said that rennet is podpuszczka in Polish. Thanks for this. I recently did a cheese making course and though we didn’t cover haloumi that day, the instructor did say it was pretty easy too. It’s so satisfying making cheese isn’t it? Just a tip for your readers, the Parmalat brand of unhomogenised milk comes in 1L packs at most supermarkets. Thanks for the tip Kristy – a cheese making class would have been fantastic! By the way… I used Parmalat in my lemon batch then Paul’s organic unhmogenised in this batch. Any full cream unhomogenised cow’s milk would work. I had never heard of junket tablets before. Your cheese looks oh so rustic and creamy! Neither had I Sneh, until I started researching why my first batch didn’t work out (haloumi is one of a few cheeses that are made without using acid). And sure enough and as suggested my local big chain supermarket had the tablets. Apparently junket tablets are used to make custards and ice creams too! Yeah, it is here too. Although so is goat’s milk – around $4 a litre that’s why i mixed with cow’s milk.You get a bit more cheese for the same amount of money. I love Haloumi cheese! This is recipe is wonderful! I just need to find these junket tablets and I’m set. I also love your tip on using whey as brine. When I make ricotta or farmers cheese I use whey for baking bread. But even then I always have too much left over. This is a great way to use whey :-). Thank you for sharing! I’ve read so many haloumi recipes, I’ve got to try making my own. And fried.. oh, my gosh!! Is it possible to do it in a normal oven? I don’t have a microwave 🙁 I would love to try homemade halloumi! Looks so delicious! Hi Good Mood Food, I have good news for you. You can still make it without a microwave using the conventional stove top method – the recipe is also provided in the “haloumi recipe” link above the second image. Now this in one thing I’m definitely going to try. So easy! The last time I used junket tablets was way back in school for some home economics task! I love you for posting this. Here in France it’s *really* hard to find halloumi. I heard there was “one guy” in a market in a nearby town which sells it but it’s not widely available. I have to wait until my parents visit me from England, or my colleague goes home to Cyprus so I can get some more supplies! Of course, now I just need to find goats milk, which is another challenge, but I think it will be easier than finding halloumi – thanks so much! I’m not familiar with “junket” tablets… is that like a rennet tablet? I’ll need to look it up. Hi Charles, you’re welcome! We are quite blessed here in Australia in terms of our food. You could make it out of straight cow’s milk or sheep milk (although that might be even harder to find). Perhaps some health food shops might stock it? And yes, jusnket tablets are similar to rennet tablets but they contain other things. Based on my research you could use 2ml pure liquid rennet or an equivalent of that in a rennet tablet. My junket tablets were 0.75g. This is such an interesting idea, I can’t believe it’s made in the microwave! Looks great! 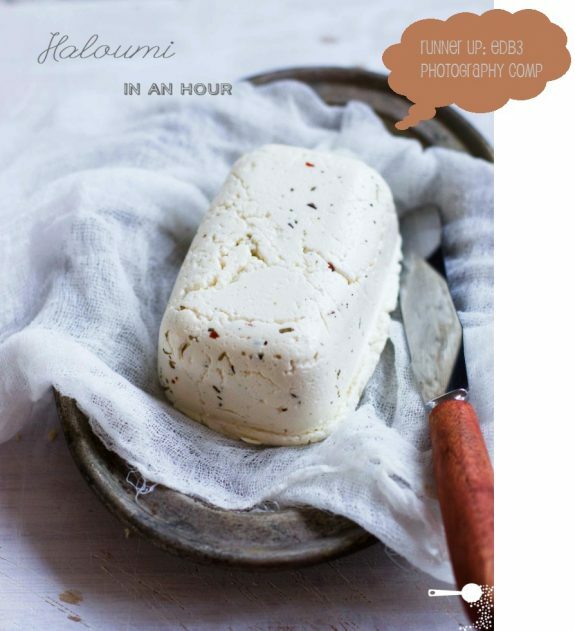 Martyna, I still haven’t tasted haloumi (although I keep on seeing it in one of my regular shops..) and already want to make it on my own thanks to your impressive accomplishment! It looks fabulous! 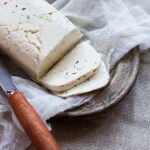 I’ve never tried Haloumi cheese before although I learned about this from several blogs. 1 hour isn’t that bad at all. Pinning to save the recipe! I had absolutely no idea you could make haloumi at home. I’m so going to try this as I make my own ricotta all the time, which is a breeze too. Thanks for sharing! By the way, I love the plate you have the cheese on. Gorgeous! Thanks Jennifer – picked up from Rozelle vintage markets here in Sydney. Rustic, gorgeous and yum! Thank you for sharing. Love the pictures. I would love to make this! Is there something I can sub for the ‘junket’…and I’m not sure where I can buy goats milk? You will most probably be able to find goat’s milk in most supermarkets or large health food stores. It gives a nice flavour to the cheese. As for junket tablets, I am only aware of them to make the cheese – perhaps contact your local cheesemaker store, or look online. Most Australian supermarkets stock junket – so try your local ones. I’m having a little trouble with this recipe. I’ve heated the milk and put the junket in; waited 30mins and it’s still liquid. It just looks like slightly curdled milk? Not sure what I’ve done wrong. Does the goats milk have to be unhomogenised too? Hi Heather, that’s what my cheese looked like until I microwaved it and it began to congeal and separate from the whey… the goat’s milk does not need to be unhomogenised. I hope the recipe ended up working for you in the end? I had the same thing happen to me until I started the microwaving process. Even then, I had to nuke it a whole bunch of times to get some curds (how much is this recipe supposed to yield?). I think the problem lay with the goat’s milk- it was ultra-pasteurized, though the cow’s milk was organic and unhomogenized. It’s cooling in the fridge right now, but seems like it’s going to be very crumbly. Mine looked a little crumbly too but it set well. I used Paul’s Goat Milk from the refrigerator section not the UHT from the shelves. Let me know how you go. As for the microwave, a lot depends on settings so you might have to microwave the mixture for longer. Oh my! Have Junket- will make.. This is fantastic, we have a friend who is vegetarian and has grilled Haloumi when we do a BBQ. I cannot wait to surprise her with this next time she comes round. OH… MY… WORD! I didn’t know this was possible. Thanks for sharing 🙂 The only problem is that UK supermarkets don’t seem to stock junket tablets as far as I can see. Thanks I’ll give you a shout it I can’t find any 🙂 Great blog by the way, I can’t remember how I can across it but I’m glad I did. the difference is that I do not heat it again after I added the juncket.i just let drain the whey from the mold.i am afraid to heat it up and ruin my cheese.by the way I add I cup or full cream milk for each cup of fresh milk in order to have more curd.did you ever tried to make chesse not usung the microwave?i don’t trust it to much it might go too hot.if someone could help me? Traditional Halloumi is made EXCLUSIVELY from goat and sheep milk (50/50) and no cow milk is used. Although my dishes are almost always vegan I consume halloumi from time to time. I guess being Greek Cypriot (halloumi has its origins in Cyprus) makes it hard for me to quit halloumi. That being said, the halloumi the rest of the world (except Cyprus that is, and some stores in Greece store traditional halloumi) gets is made from Cows milk mixed with goat/sheep to lower the production costs. P.S. The only product we have in Cyprus in so many varieties (as in mixed, traditional, low fat, etc.) that the rest of the world does not have is halloumi. My grandmother was an avid junket- eer. She used it in everything containing dairy. It predigests cows milk proteins and lactose. It’s great for peeps with a lactose intolerance. There used to be a local manufacturer who sold it in tablet form, half the pack plain, and the other in various flavours. My childhood milkshakes were milk and junket for the flavour. It disappeared from supermarkets sometime in the 1990s. It’s a terrific product, containing amylase, the enzyme that digests lactose: so recent “lacteze” tablets, are some new style of junket. The predigestion / fermentation is why so many lactose intolerant peeps can tolerate real yoghurt and soft/ briny cheeses! Btw love the microwave haloumi method for this time poor mama! Hi Elizabeth, thank you so much for all the info on junket. 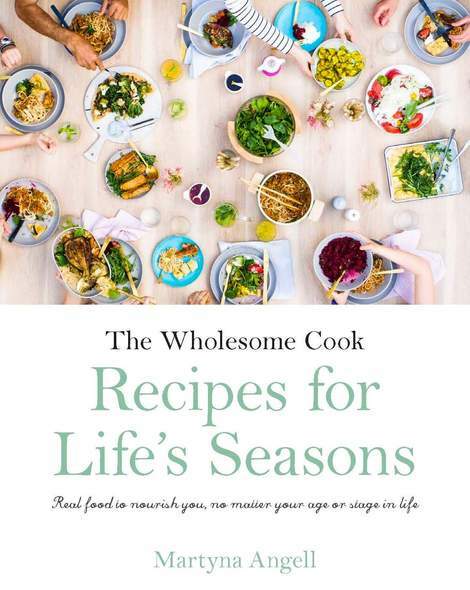 Great read 🙂 Enjoy the haloumi too. Came across your post while looking up some info on Halloumi…we don’t get junket tablets in India,never heard of them.Is there another alternative,maybe yoghurt ? Your halloumi looks yummy !!!! Hi Shanthini, unfortunately junket (also known as rennet) or a similar coagulant is needed to make this cheese. You are probably having trouble finding it in India because it is normally obtained from cows… However, you might be able to odred non-animal (vegetarian) rennet tablets online from places like Amazon or health food stores in your country? Hi Martyna! 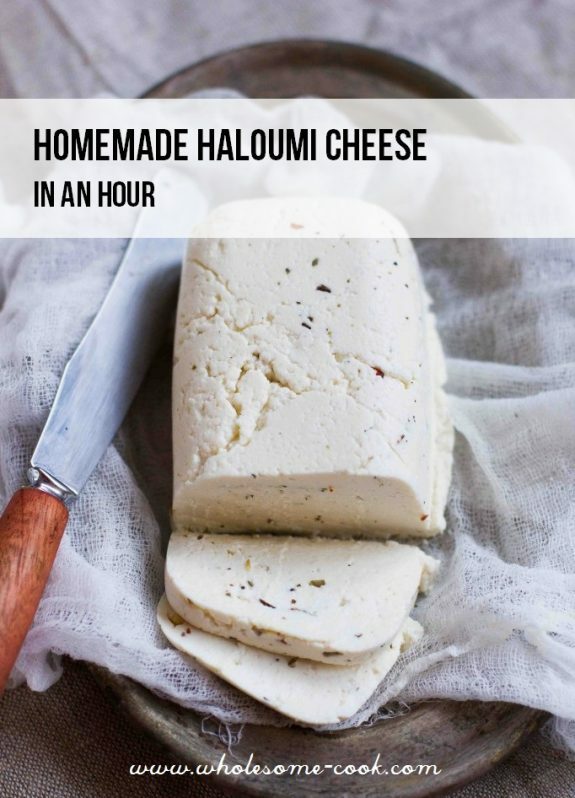 I have been looking for a good beginner cheese recipe…and halloumi is one of my favourite cheeses, which I don’t get to consume much because of the price. I found rennet tablets in south africa, but they say one tablet is enough for <20L milk. Does this mean I should use a half tablet or quarter tab??? Appreciate your help so much…I am very excited!! Hi Martyna! Thank you for posting this recipe – I’d been wanting to try my hand at simple cheese-making, and this is a great start! I love haloumi, though I’ve had to drive an hour to buy it. I was surprised by the amount of salt listed, and then I thought perhaps I should have used kosher salt? I am certainly going to make this again. Hi Just wondering where do i get the left over whey i know sounds stupid but how do you actually make the whey or can you buy it? Hi Nadine, I’d be guided by the expiry date of your milk and you nose. I’d say about a week if you keep it in the whey. 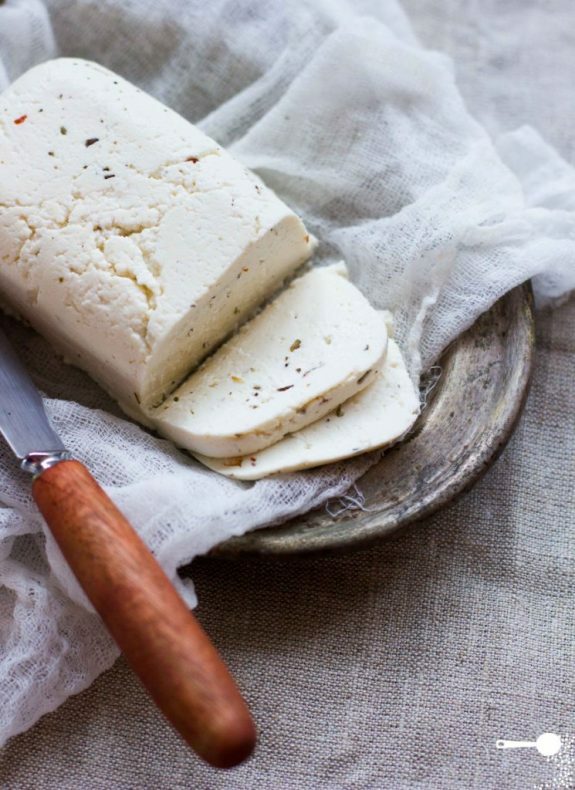 Thanks for sharing this herbed Halloumi recipe. Can I use purely goat milk for this recipe? Yes you can, make sure it’s in homogenized though. When you say put the chees into the microwave, is that just the curd or whey aswell? Hi Keith, it’s both the curds and the whey… together in a bowl. Thanks for this fast method! Up till now I only tried the traditional version. In that recipe it is important to filter the whey from cheese making through some cheese cloth to remove any whey protein/ricotta from sticking to the final halloumi. Very disappointed with this recipe. After microwaving for at least 20 minutes I ended up with hot milk, a tablespoon of curds and a messy microwave. An expensive and disappointing disaster! I’m sorry to hear the cheese didn’t turn out for you. I’ve made it countless times now and it’s always worked for me. It is true for most cheese-making that you do end up losing half or more of the milk to whey as well. Sorry I meant a bowl full of WHEY – not milk! First time at making any sort of cheese and so far, so good. Haven’t fried it up yet as its still sitting in fridge. Great recipe though- thanks! But what do you do with all the left over whey? Can I make a ricotta cheese out of it? Hi Florence, I just keep it in the fridge / freezer and add to smoothies. Not sure about making ricotta from it as the solids go into making the haloumi. Also I can only get up goats milk unfortunately. Will it work? I live in Italy and no junket tablet here, but there is podpuszczka, in italian caglio. This is in liquid version. Any idea how much I should use it? Hi Eliza, I’m not sure – you would have to have a look online for maybe some polish recipes using podpuszczka with haloumi. Sorry I couldn’t be more helpful. I don’t have the tablet, but I have the liquid…Do you know how much I would use of the liquid in place of the one tablet of junket? Also…would this work with all goats’ milk? I can’t have cows’ milk. Hey Monika, I am not sure about exact conversion of rennet to junket and how it would work. Perhaps try googling those? Sorry, I could not help – and yes, I think goat’s milk would work here as well. Thanks Martyna for a quick recipe and alternative milk and heating methods. Reply to Heather and others having trouble with the warm (not hot) milk setting. the JUNKET TABLETS MUST BE DISSOLVED IN WATER BEFORE ADDING TO MILK. Plain junket tablets should be pure rennet, if not write to the manufacturer and ask them ‘why not’. Other Junket tablets can be flavoured and usually is written what type on the box. All children after the war would have been familiar with Junket as it was a government recommendation that children have milk in their daily diet. If they didn’t have it at home their school friends would have. A lot of cheese making starts with this basic method. If you can’t find Junket tablets (and it was hard to find for many years if not decades in Australia) pure rennet does the job if you can find it. I believe though Stinging nettles will do a similar job with setting the milk. But I am not familiar with this, and one would need to ask a competent cookery herbalist for alternatives. Best wishes for today. Looking forward to trying this recipe with my children! Question: Can I easily use 2 litres of goat milk instead of one of those being cow’s milk? I think so! Enjoy and have fun! Another use for whey is as a base for soup stock. Thanks for thehaloumi recipe, I, try it with full team homogeised as we can,t get raw milk here. Quick question. Once you have added the junket and waited and mixed to seperate whey – do you just remove the solids to put in microwave or tip solids and whey into bowl. Recipe doesn’t say what to do with this whey.